Greetings...looking for suggestions. I am currently sitting on about 2 million Delta miles....I know....please no lectures. Looking for suggestions on where my wife and I should go visit. I really enjoy flying and still think it is amazing one can get around the world so fast. Looking for a mix of good business/first experience on the flight and neat destination. We really enjoy outdoors activities...running/cycling/hiking/diving etc. Big cities are OK for a day or so but not really our thing. Starting in SEA and can really go anytime. Anyone have cool experiences they want to share? Thanks. The best J experiences out of Seattle for the foreseeable future are going to be TPAC flights to asia. The new A330NEO is rumored to have suites when it launches mid year, and will be covering SEA-ICN/PVG/NRT at first. Have you ever done Japan? It’s a lovely place to explore, and given what you’ve described I think the Kansai region (including especially Kyoto) would be right up your alley. New Zealand is another great outdoorsy destination. Not the easiest to get there on miles, but if you can find Virgin Austealia award availability and are flexible it might be possible. Try searching LAX-BNE-AKL/CHC/ZQN for the best chance at finding something; you may need to pay for SEA-LAX yourself on a separate ticket to get the lowest rates. Dont forget YVR is close by. Lots of DL partners fly out of there (China Airlines, China Eastern, Air France, KLM, Korean Air) giving you lots of chances to find decent award redemption values. Let's see, 2 million Skymiles . . . at current redemption values that might get one of you to Des Moines and back in J. Seriously, you'll be able to have a nice trip, but J redemptions on DL are just ridiculous. Somebody recently reported a 1 million Skymiles ticket. Think about a walking trip in Europe, what is called a “self-guided walking tour” in which you walk from inn to inn with your luggage moved each day. Europe is full of marked trails through woods, farmland, coastline, mountains, villages, castles, manor houses, ruins, etc. England is a good place to start because there are a number of companies there (US companies tend to be more expensive than European ones) that can set it all up and provide the maps and walking guides you need. PM me if you want more details; I’ve done five such walks in England, three in the Netherlands, and leave for a walk in France next week. It’s a great way to visit a country, a kind of micro-travel. I haven’t yet done the above kind of walking trip in Norway but can strongly recommend that country to those who love the outdoors. It is spectacular! Some other Asian destinations to consider: Penang, Malaysia; Luang Prabang, Laos; anywhere and everywhere in Sri Lanka. I loved Yogyakarta and Borobudur (keep it on your bucket list, hotturnip) and didn’t care so much for Bali, but many people love Bali. If I had miles and flexibilty, I would wait for the next award sale and see where I could go for a reasonable number of miles. Award sales often save a factor of two or more in terms of the number of miles required. SEA-KIX (Kansai airport, Osaka) flight is starting up in April. Kansai area is rich with history and great things to see. It seems to be the true Japan that people think about when wanting to visit the country. Partner awards to Asia (currently 85K one-way in J) are considerably easier to find out of SEA than east coast cities. Here is SEA-DPS in availability in Apr/May. The J award summer sale to Europe (64K each-way - except LHR) is also still active. I’d skip Japan. More city-focused. Also be careful of many SE Asian destinations. Many are catered towards relaxation and urban partying, not outdoor activities. All destinations reachable with DL or a partner. Suggest you add LAX as a departure airport in your search. I would begin by checking award charts for the full 11 months out- to the end of the schedule. The people who complain about J awards being insanely overpriced are just too lazy to plan ahead. I'm SEA based and heading out on a trip for 4 to Japan in J....booked as one ways, 70-80k each. That's 8 one way tickets, all in D1 suites. There are plenty of good deals out there if you can spend 3 minutes checking award charts every 2-3 days. I've booked trips in J to South Africa, Southeast Asia, Japan, China/Hong Kong, Europe....all for less than 200k RT, so you have plenty of options. The other thing that helps is knowing the route map. For example, there are flights to CDG from just about every single DL hub and a few focus cities. If SEA-CDG is outrageous, I know that I can find a better deal by searching out of each other hub individually (sometimes for half the price). I realize the question was more about destinations than how-to, but my point is that you can go just about anywhere five times over with that balance and you should make the most of it, instead of settling on the first fare you find. The center of Taiwan has some beautiful mountains and an epic bike race (News - THE Taiwan KOM Challenge) - how about a trip to Taipei? 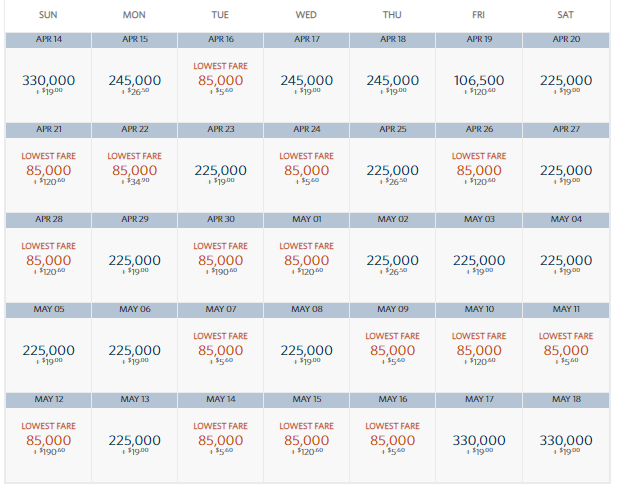 You won't find anything to Asia in J on DL metal for less than 120K these days (CSV1200 fares). Partner awards remain at 85K as noted upthread. So I think you're really asking "where should I go in the world" because you can, of course, get to almost any commercial airport from SEA on DL and partners. With that many miles I would go for some of the harder to book destinations, even if you end up spending more. Australia, New Zealand and South Africa all come to mind. South America also, perhaps doing a guided hike in Patagonia. There are some high end tour companies that lead groups on rigorous day hikes in places like Patagonia, etc, and during the day they truck your stuff from one luxury hotel to another.